Looking to take your youth on an amazing experience? We've got what you're looking for. ​Youth groups are all about creating opportunities for the next generation to grow. That is why we are excited to be able to offer amazing experiential tours and programs for organized youth groups of all sorts. Cadet corps, scouts, and a variety of other youth groups are welcome to experience and learn about history through our programs, available at both our main site, the Elgin Military Museum, and our fantastic SUBstation, HMCS OJIBWA. Whatever your group is into, we can specialize our programs to match. The best way to reach youth is through multifaceted, interactive experiences that draw them into a story. Our Land, Sea, and Air program is a fantastically well-rounded approach to learning about the three services in World War II. In partnership with the Canadian Harvard Aircraft Association based at the nearby Tillsonburg Airport we offer a dynamic hands-and-feet-on insight into WWII utilizing the real experiences of local veterans. At HMCS OJIBWA, the submarine provides the venue for students to learn about the Battle of the Atlantic and the incredible role played by the Canadian Navy and Merchant Marine. Then it’s on to the battle segment of the day where students have the opportunity to watch and reenact specific episodes of battles such as Dieppe and learn first-hand about the life of an infantry soldier. Finally, the students go to the Tillsonburg Airport where members of the Canadian Harvard Aircraft Association provide a hands-on lesson about the planes that formed the backbone of the Commonwealth Air Training Program. ​Below is a drop down list of all of the programs that we offer. Some are available at HMCS OJIBWA, and others at the our main location at the Elgin Military Museum. Click through and see which ones might engage your youth! Students will wear the white gloves and become detectives as the open Suitcase 42, recently discovered by EMM staff. Filled with primary and secondary source documents, students will use the materials to create a biography of the suitcase's hero, a WWII pilot. They will also catch a glimpse into WWII through his father's letters and discover why Suitcase 42 is more than just a museum artifact from 1942. What does Picasso have to do with army uniforms or ship design? Students take an arts-based expedition through WWI and WWII utilizing the works of visual artists, musicians, and writers. What do wartime artists communicate and how do their works affect societies? Students will create song lyrics or a graphic novel panel. Art and history teachers- this is an integrated experience. Students will get to know WWI and WWII local heroes of Elgin County by applying journalistic techniques to create a mock interview of their chosen veteran. Students will also explore the loves of the often forgotten women and children who remained on the home front. How has gender-based bias in the media and the armed forces changed social perceptions of traditional roles and concepts of heroes? A one-of-a-kind program that looks at the dynamics of relationships in high pressure environments and how the purpose and design of the workplace impacts those relationships. Add to that an intense layer of imminent danger and you have a recipe for communication as a fine art! Did we mention bad smells. a dose of laughter, and a few spine tingles? 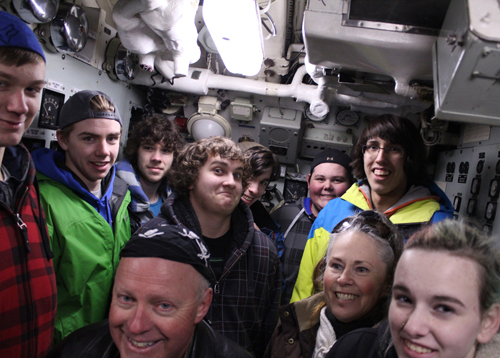 Our regular Submariners and Fisheye tours of HMCS OJIBWA are also available at special rates for cadet corps and youth groups. Contact us and we’ll be happy to help you arrange the best tour for your group. ​We’re no strangers to large tours, and with large tours often come large vehicles. There is plenty of free parking for your buses or coaches on-site, and we’re glad to host your vehicle if you decide to explore the surrounding area, as well. ​Of course, a youth group requires chaperones. At HMCS OJIBWA, children between ages 6 and 12 require at least 2 chaperones per every 8 youth. Guests age 12 only require 1 adult per 9 youth, and if your organization requires a higher adult/student ratio, please ensure to meet those requirements, as well. ​HMCS OJIBWA is heated in the winter, but just enough to take the edge off, and some of our programs have large outdoor components. Group leaders are encouraged to ensure members wear warm clothing during the colder months. We want everyone to be warm, dry and comfortable during their visit. Not that those not dressed properly will not be permitted to take part in activities they are not prepared for. ​We’re open all year ‘round with a seasonal schedule. To find out when we’re open during this season, visit our hours page. ​Contact us at 1-519-633-7641 or tickets@projectojibwa.ca for prices and more information about arranging group activities and tours. You can also download our flyer by clicking the link below.